Step 2: Each of us picks a few different styles, brands and colors to try out for ourselves. Step 3: We wear them, wash them, and wear them again. Spending a significant amount of time in the garments and doing everyday activities allows us to really see how they move and fit throughout the day. Step 4: Write. Down. EVERYTHING. Things we love, things we hate and things we’re indifferent about for each product. Step 5: Compare notes and share what we’ve learned! We chose to start this series off with raglan shirts when we realized that half of our team didn’t actually know what a raglan shirt was. When you think of a raglan, you probably picture a classic baseball shirt style with 3/4 length sleeves and two separate colors for the body and the sleeves. You would be right. Well, you would be half right. The term raglan actually refers to the construction of the sleeves. Raglan sleeves do not have a shoulder seam. Instead, the sleeves are one continuous piece of fabric going all the way up to the neck, and typically with a diagonal seam in front of the shoulder. Hoodies are an example of raglans, as are most athletic jerseys. 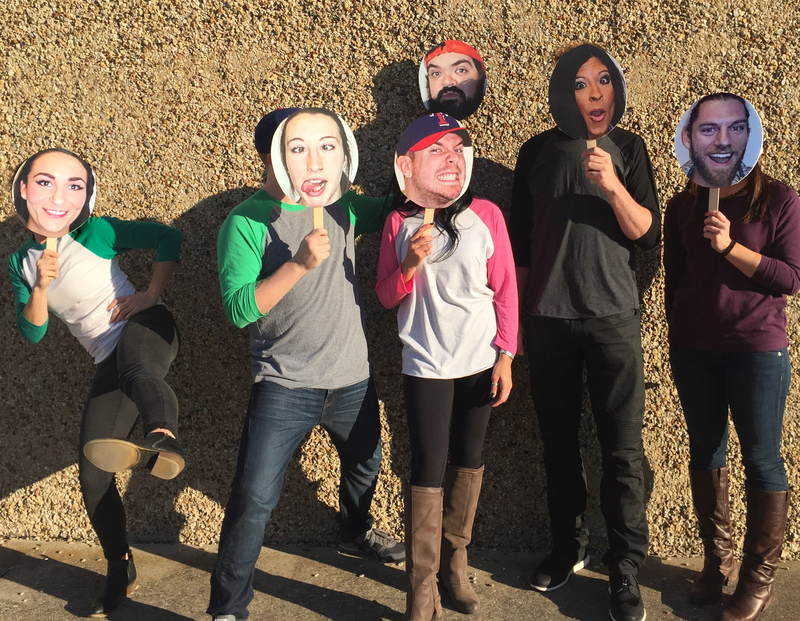 So once we all figured out what a raglan is, we ordered some samples. We chose a few different styles from these brands: American Apparel, Next Level Apparel, Sport Tek, Gildan and US Blanks. Material: Very thin, which means the shirt is very soft but also can be somewhat see through if you select a white body. Color options: Available in 25 color options, the most of all raglans reviewed in this post. Any changes after washing? : No, this shirt does not shrink up or lose color in the wash.
Material: This raglan is a tri-blend, which means it’s super soft and comfortable all day long. Material: Thicker material, does not stretch in the sleeves or at the waist. Color options: 18 color choices available. All solid colors, 4 neon options. Any changes after washing? : No, this product did not lose shape or color after washing. Material: Thin. The bottom of the shirt rolled up significantly throughout the day. Any changes after washing? : Yes, this shirt shrunk after washing. Fit: A little larger than expected. More of an athletic fit. Material: This shirt is more stiff than other shirts we reviewed. It’s more for athletic wear than for fashion wear. Color options: 19 color options available. Any changes after washing? : No changes after washing, still a bit stiff. Don’t forget to subscribe here at Just Inkin’ Around and check us out on social media. Posted in best, brands, product review, product review panel, raglan, review, Screen Printing, services, shirt styles, Uncategorized and tagged as american apparel, baseball shirts, bella canvas, best, better, good, impressions, next level, product reviews, raglans, sport tek, tshirts, tultex, us blanks. These are some great shirts! We like them all.